Pediatric health professionals are an integral part of a family's health journey. Whether it be a medical doctor, nurse, or mental health specialist, each can offer advice on how a dad can be more involved in his child's health. Similarly, dads can share examples of what has worked for them and their families. The Pediatrics Corner provides resources that both parties can use to improve the father-child relationship as it relates to health issues. Click on the blue tabs below for more information. Historically, moms have been the ones to take kids to doctors' appointments. As more dads join the conversation, it's important that the medical staff creates an inclusive environment in which both parents feel comfortable. This link provides resources on how that can be accomplished. From birth to age 21, doctor's appointments help health professionals and parents ensure that a child is reaching developmental milestones and is growing strong. This link provides information for dads on what to expect during these visits as their child grows. The research on dads is limited, but growing. Both health professionals and dads can benefit from the available literature to gain insight on what can strengthen the pediatrics-father-child relationship. 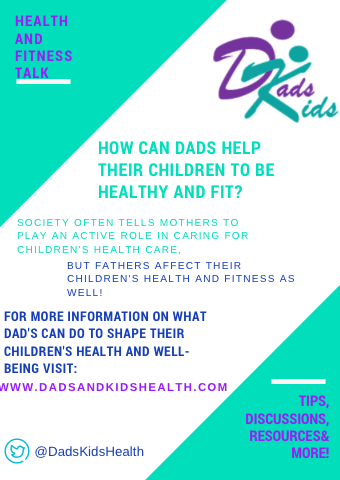 Below is a flyer that health professionals can print out and put in their offices to encourage both fathers, mothers, and their children to visit this website and take advantage of its resources.